My readers often ask me to recommend speakers to use with the Audio Technica AT-LP60 USB and AT-LP120 USB. Receivers are expensive and many people prefer to have few things around to avoid clutter. I thought it would be helpful to write an article for people needing a simple audio setup for their turntable. The information on this article applies to any turntable that has RCA LINE level outputs, not just the AT-LP60 USB. There are some self-contained record players on the market with built in speakers. However, most good turntables, are sold separately without speakers. Separate component record players, like the AT-LP60 and AT-LP120 need a set of speakers and an amplifier to work. In my review of the AT-LP60, I explained different possible audio setups. The simplest setup consists of directly connecting your turntable to a pair of powered speakers through a RCA cable. On the AT-LP60 and AT-LP120, the RCA cable is hardwired to the back of the unit. Just connect the RCA cable of your turntable to the RCA input of the powered speaker. The setup looks something like this. Notice that the speakers are self powered. It means that they have a built in amplifier. Powered speakers need to be connected to a power source. If your speakers don’t have a power cord, they won’t work unless they run on batteries. Any powered speakers will do, but for this article, I chose computer speakers or studio monitor speakers that have RCA LINE/AUX inputs and that cost less than $200. The Audioengine A2+ is one of the most popular speakers used by turntable owners but I didn’t include this product here because it cost more than $200. They are often sold in a bundle with the AT-LP60 USB. I thought it was important to mention it. The setup outlined above is very easy and convenient but there are some downsides. Separate component turntables don’t have a volume control. This means that you have to control the volume from the speakers or from the receiver. Receivers are great because you can control many aspects of the sound during playback like volume, equalization, balance and they even have a remote control. Unfortunately, they are expensive and speakers are still needed. If you choose to use powered speakers instead, you won’t be able to control the equalization of the music and you will have to control the volume from the speakers without a remote control. I don’t find this a problem but it depends on each individual’s preference. Recording studio monitors sound great, but the equalization is flat since they are designed to reproduce the recording mix as accurate and clear as possible. Again, I don’t mind the flat equalization, but if you decide to go with studio monitors, be aware that you won’t have complete control over the sound. So, you save space and money but you loose control over the sound. What follows is the list of powered speakers with a brief description. They are sorted out by price, least expensive first. If you find them too expensive, you can search for cheaper computer speakers. Just remember that the cheaper the product, the lower the sound quality in general. An affordable option for someone on a budget. The Logitech Z323 has a clear sound with rich bass. You can connect your computer, DVD, gaming console or tablet as it comes with RCA and 3.5 mm inputs. It has headphone and line connections. On the back of the subwoofer, there is a knob that lets you control the bass volume. With its power of 30W you can fill up a small room. The Logitech Z323 has many positive reviews and ratings. Some consumers recommend using the RCA inputs as the 3.5 mm are bad quality and may produce some bass distortion. If you need more power you may consider the Z523 with 40W, it has better sound and the location of the bass knob is more convenient. It costs a little bit more, though. For the price, this pair of studio monitor speakers produce a great sound. You can connect your turntable to the RCA inputs. It also come with 1/8” stereo input and two 1/4” inputs. These speakers come with a USB port, so they can be connected to your PC. You can play music from your computer. You cannot, however, connect your AT LP60 USB directly to the Alesis M1 USB port. The USB is port is only for PC connection. This set of speakers work as an audio interface. It means that you can record your vinyl records into your computer through the speakers. This is very helpful if your turntable does not have USB connection. These speakers have a headphone jack and a bass boost switch. They have a power of 10W per channel, so they may not be to loud for a large room. A very popular set of speakers with a very clear sound. It has RCA inputs and a 1/8” aux input. There are some differences between the AV 30 and AV 40. The AV 30 has a better price. It has a 10W per channel amplifier. The AV is more expensive but it has a better amplifier (15W) and the speakers are bigger. They also have a better frequency response. The AV 30 has lower ratings, many complains about one of the speakers not working before a year of use. Mackie is a trusted brand and this set of monitors is very popular. This product has many positive ratings and reviews. The CR3 Multimedia Monitors have a very competitive price and they produce a very nice and clear sound. It has a volume knob on the front. They have RCA, 1/4” and 1/8” inputs. They come with a headphone output. There is no bass volume knob. These monitors feature 50W of power. With its position selector you decide which speaker output the left or right channel. Because of the great ratings of this product, I’m even thinking about buying a pair for myself. The MS40 has an amlifier of 20W per channel. This product has good ratings. It has digital inputs and analog inputs. In the case of a turntable you don’t really need the digital inputs. It has RCA Line and 1/8” analog inputs. What I like about this product is that it has both Bass and Treble control knobs which gives you a little bit of control over the equalization. It has a connection for headphones with 1/4” jack connector. There are really endless options, specially if you have a good budget. You could hookup your turntable to a home theater system, receiver, wireless transmitter or an existing stereo sound system. 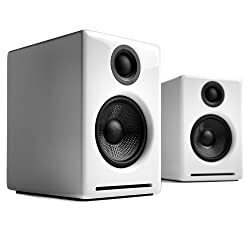 If you are on a tight budget, you may consider buying a set of inexpensive computer speakers, there are tons on the market. Finally, there are three more powered speakers that are popular among turntable owners, but I didn’t include them here, either because of their price or lack of RCA inputs. I just wanted to mention them, just in case. Bose Companion 2 Series III, Presonus Eris E4.5 and Audioengine A2+. I recently bought an audio tecnia lp120 turntable and I want to buy the mackie CR5BT to play my records but I am not sure if it would be the same thing as getting the mackie CR3. Would it be compatible with the AT-LP120? Would I have to put it on phono or line when I connect it to my turntable? And also i wanted to know that because my AT-LP120 will be set up on my spacious living room will the sound be clear with the Mackie CR5BT? The Mackie CR5BT are great speakers! Plus they have bluetooth connectivity. With the AudioTechnica LP120 you don’t need anything else. You would have to set your turntable to LINE. The sound will be very good for your living room. The only downside is that you won’t be able to equalize the sound, but the sound is very clear. Congratulations for your website. This information is really helpful. I just bought the AT-LP60 and I was wondering whether to buy the Edifier R1280T Powered Bookshelf Speakers, the Mackie, or something similar. Do you have any additional recommendations? I don’t want to pay more than $100 and was actually thinking in something small. I would go for the Edifier R1280T. I’m going to include this one on my list. Have a nice listening. Would you recommend the Edifier r1280t? It has some very good reviews and I’ve found they’re even better than the Mackies. What have you heard about it? The Edifier Edifier R1280T powered speakers are a great option. They look better than the Mackie CR3, in my opinion. You have a little more control over the sound because they have treble and bass knobs. And they also come with a remote control and RCA cables. Both are about the same price. Hey There, i’d like to start by saying i am in absolute love with your website! I just recently purchased the AT LP-60 and was wondering if you could tell me what else do I need to buy to pimp this setup. As far as i know it’s a receiver and a pair of speakers and wire (don’t know which one). I’m on a budget though so was wondering if you cold give me advice on which amp and speaker setup i could get for under $150? Thanks for your kind comment and congratulations on your AT-LP60. If you buy one of the speakers listed on this article, you are set to go. No need for anything else. I have the Mackie CR3 powered speakers. They produce a very clean sound. I’m very satisfied with them. The sound is not too loud, though, and you won’t be able to control the equalization. I use the MK CR3 for my home recording projects as well. If you wan’t to have more control over the sound and equalization, then you may want to get a receiver and a pair of bookshelf speakers. This setup goes a little bit above your budget. If you need something more afordable, you may consider buying pre-owned equipment. For example, you can get an used Sherwood receiver for about $80. I just purchased an AT-LP60 with the Logitech Z323 speakers and I’ve been having some troubles with hooking them up to the record player. I’m new to this I apologize, do you think you can walk me through the set-up? 1. Set the pre-amp switch on the back of your turntable to LINE. 3. Make sure your Logitech Z323 is pluged to the power source. 4. Turn on the speakers and you are set to go. Great article. Very helpful. 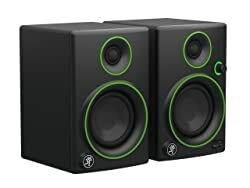 I just purchased a pair of the Mackie speakers. But I’m somewhat happy with the inability to adjust the bass (which I knew would be an issue going in). So I’m thinking of buying a 2-channel stereo receiver to give me more control over the sound. My question is: would the Mackie speakers pair ok with a 2-channel receiver (Yamaha R-S201BL 2-channel stereo receiver, for example)? I know what you mean. Mackie speakers are reference monitors, they are designed to give you a clean and accurate sound for multimedia creation. The problem is that the equalization cannot be controlled. That’s not good for a listening experience. It can be frustrating. Mackie speakers would not pair well with Yamaha R-S201BL. You will need bookshelf speakers, tower speakers. Your mackie speakers are powered. They cannot be connected to the Yamaha receiver. I have an Audio-Technica AT-LP120-USB with its output set as Line. I tried with a cable adaptor connecting it to a Bose Soundlink II and to a Sonos Play 5. In both cases the sound that I get is pour, dirty. Any idea of what could be happening? Should your 5 powered speakers options perform better than the 2 that I tried with? It’s weird, they should work just fine. Your Sonos Play 5 should perform better than the powered speakers I presented. I have a Mackie CR3 and it sounds very nice, very clear, no distortions or background noises. The Mackie CR3 speakers work very well in a small room but they wouldn’t fill up a large room. Any way, I think your Sonos Play 5 should perform better than my Mackie CR3. 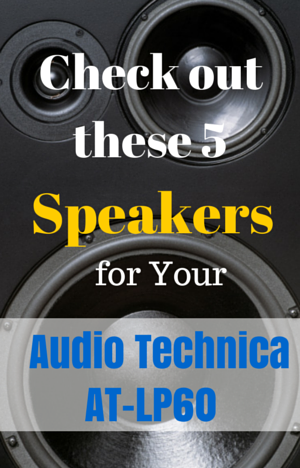 Have you tried with other speakers? Can you describe with more detail what you mean by poor and dirty? I would check the cartridge and make sure the cables are properly connected to the headshell. Check your adapter cables with other devices like your phone, cd player, mp3 player to see if they work fine. Make sure also that the tone arm is well balanced ant the tracking force set appropriately. Hello. I just read your article and i found it really informating and i just wanted to thank you. I also have a question. I’m really new into turntables. I was thinking about purchasing the Audio Technica LP120USB turntable and the Mackie CR3 speaker you suggested. I’m ordering from Amazon USA and i live in Turkey and it will take a long time to ship here so it would be disappointing if i made a wrong decision. Do i need anything but these two devices? Can i just plug the turntable to the speaker and put a record and listen? And i probably won’t use the speakers in a higher volume than a regular MacBook speaker. Will the Mackie CR3 will be a right decision for me? I have a JBL go speaker and it’s well enough for me. Can i use it as the speaker? The Mackie CR3 speakers work great with the AT-LP120. You won’t need anything else. If you already have JBL speakers, go ahead and use them. Just make sure they are powered. Can you tell me what model are your JBL speakesr? Can I hook the ATLP60 to Polk Audio m10 bookshelf speakers with speaker wire? No, the Polk Audio m10 bookshelf speakers are not powered. You are going to need either an amplifier, receiver or an stereo system. For example the Yamaha R-S202BL Stereo Receiver. 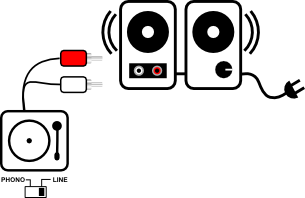 Your turntable will have to be connected to a receiver first, and then connect your speakers to the receiver. I’m looking to buy the Edifier R1280Ts for my Sony PS-T2 turntable. My turntable doesn’t have a built in pre-amp, do I need to buy a phono pre-amp for these speakers to make them work in a turntable/speaker system? Yes, you are going to need a phono pre-amp. I have just bumped into this as I am a bit lost trying to figure my set up. 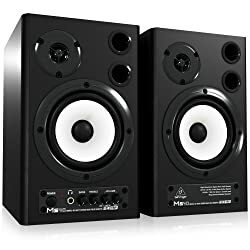 I own a AT-LP60 and have just purchased a pair of M-Audio BX5 D2 Compact Active Studio Monitor Speakers to go with it. The speakers are a pair but not connected to one another unlike the AV30/40 and come with a power cord/ plug each. Please how do I connect these both to my turntable? Can you recommend what exact products to buy? Thanks a million! Each of your M-Audio BX5 is powered, that is why you have a one power cord for each. You are going to need a pair of RCA to TRS adapters (1/4 inch mono). Depending on how you place your speakers, you may also need a pair of RCA extension cables. To connect your AT-LP60 attach the extension cords first, then the RCA to TRS adapters. Last, connect the adapter end to each speaker. Make sure your turntable preamp switch is set to LINE. Turn your speakers and enjoy. I just ordered the Audio Technica LP60 as a gift and I am completely new to this. I wanted to get something nice and easy to use for my friend, but I didn’t want to get a reciever and speakers. I wanted to get the Bose Companion 2 you have mentioned, but could you walk me through setting them up? I wanted to make sure they are actually compatible and sound nice before I order. Sorry if this question will be simple to answer or have been answered before. Just need some help! Sorry for the late response. I’ve been busy lately. Yes I can walk you through. It’s very easy. Your AT-LP60 comes with two adapter cables. You are going to need the one with the male jack. 1. There is a small switch on the back of the turntable. Make sure to set the pre-amp switch to LINE. 2. Connect the red and white ends of the adapter cable to the RCA cables of your turntable. 3. Connect the male jack end of the adapter cable to the Aux In input on the back of your Bose Companion II. 4. Connect your turntable and speakers. Let me know if you need more details or pictures. I’ve been trying this approach with my Creative Gigaworks T20 Series II but to little avail; only the right speaker outputs sound, the left either sounds distorted/muffled or doesn’t output at all. There is nothing wrong with my speakers as far as I’m aware, and the turntable (an Audio Technica LP120) is fresh out of the box. Any suggesstions? It looks like one of the channels is not working properly. Just make sure the cartridge and stylus are attached properly to the headshell. There are four small cables that go from the headshell to the cartridge. Make sure there are properly making contact. Some times those cables are loose. If that doesn’t fix your issue, I would contact Audio-Technica, they have great customer support. Will an Audio Technica AT-LP60 work with Bose Companion 2 Series III Multimedia Speakers? Looking to pick up a the vinyl player soon just wanna ensure it is compatible with those speakers, there are no RCA inputs from what I am aware of. Yes, the AT-LP60 will work with Bose Companion 2 Series III Multimedia Speakers. There are no RCA inputs as you said but the Audio Technica Turntable comes with two adapter cables that you can use. Just connect the male end to the Aux In of the Bose Speakers. Hi, great reading the discussion here. My girlfriend just gifted me the audio technica lp-60 turn table. I tried to play it hooking it to my bose sound link mini speakers using a RCA to 3.5 inch converter. However the volume was really low, not enough to fill my room. The speakers generate much better volume when used with my iPhone ovef bluetooth. Is it a speaker issue and do I need powered spezkers? Thanks!! Have you check the preamp selector on the back of the turntable? Make sure it’s on LINE. It should sound find. If you are still having the same issue let me know. This article is great and exactly what I was looking for, thank you! After reading this article and the simplicity of set up, I feel more confident about my recent purchase of the AT LP120. Do you have a previously published article or perhaps a response to a comment (so many I couldn’t read through them all) about wireless speaker set up? How do I connect my record player to wireless speakers? Currently, I do not have a receiver and I have a budget under $200. Is this realistic? Can I find a simple set up with decent sound quality? There are many very affordable wireless receivers and transmitters that you can use. I’m not sure about the quality though. For example, you can get the Miccus Home RTX: Long Range, Bluetooth Music for about $50 or if you want something cheaper ($20), you could get the Mpow Streambot 2-In-1 3.5mm Bluetooth Audio. Of course there are more expensive ones. Or you can simply search for “Bluetooth Transmitter and Receiver” on Amazon or eBay. Basically you just connect your turntable to a wireless transmitter and pair it with your Bluetooth speaker. If I have speakers that have a volume control on them, but want to go through a receiver for sound, would I still be able to go through the receiver to control the volume or do I need to purchase speakers without a volume control on them? It really depends on the type of speakers you have and the receiver. To be able to help you more, I would like to know your speakers model and brand. You can reply to this comment with the information or contact me through the contact page. I’ve just bought this turntable and have tried to connect it to my iPod dock (it’s this one http://www.amazon.co.uk/IWANTIT-IPH10011-iPod-iPhone-Speaker-Black/dp/B00BJJWQ3K) using the RCA to 3.5 mm jack adapter that came with the Audio Technica. This doesn’t work, only a low sound is produced from the turntable itself and not the dock. I have made sure that it’s switched to ‘Line’ at the back, that all the connections are secure, and that the speakers work well with other devices. Still nothing. I’d be grateful for any help you could offer! I see that the IWANTIT IPH10011 speaker dock has a remote control. Push the button ipod/AUX from the remote control to select the aux input. Do you have the AT-LP60 or the AT-LP120? Have you tried to use the turntable with other speakers? Does it work? Do the IWANTIT speaker work with other devices? It worked! Thanks so much, I really appreciate your help. I had the Audio Technica LP-60 and Micca MB42 bookshelf speakers given as a gift. I’m not an audio expert, but as far as I gathered I may need another piece of equipment that didn’t come with either? Thanks for any help. Yes, Micca MB42 are passive speakers. You will need an amplifier, stereo system or a receiver. The other option is to exchange your bookshelf speakers for Powered Speakers or Computer Speakers. One affordable option for you would be to buy an amplifier like the SMSL Audio 36. There are however tons of options depending on your budget. I have Numark n wave 360 and the sound is very low. How do I fix this ? What turntable do you have? The N-Wave 360 speakers should work fine. Make sure you are sending a LINE level signal to your speakers. Depending on your turntable this may or may not apply. If you are using the AT-LP60 for example, make sure to set the preamp selector switch to LINE, otherwise the signal is going to be very week. I purchased the Lepai 20+20 amplifier after doing some further research about what others had done. But it also appears I may need more equipment still? Is that the case? Would I need speaker wire, or something else to finish this off? Hi I bought the at lp60 turntable and the micca mb42 speakers I know I need something else, I don’t want to return the speakers. I read in the comment above that the smsl audio 36 amp is a good option. If I buy that will I need anything else? Thanks for your comment. You’ll need to buy speaker wire. It’s very simple. First, make sure you set the pre-amp switch of your turntable to LINE. Connect the RCA cables (red and white) to the amplifier (smsl audio 36). Connect your wires from the amplifier to the bookshelf speakers (mica mb42). Turn the volume of the amp all the way down before you turn it on. Turn on the amp and adjust the volume. I bought the combination AT LP-60 with the speakers from AT. It seems really quite. Is this because of the speakers? Should I buy different ones? Can you tell me what speakers you bought? Make sure your preamp switch is set to LINE. Great article. The have ordered the lp60 any Mackie cr3s.. Will i need anything else, or can i just plug the turntable and monitor together? Anything else you might suggest i need? And any specific advertising advice for hooking them up for best results? Thanks for your comment. Congratulations on your AT-LP60 and your Mackie CR3S. That is all you need. Just connect the RCA cables directly to the Mackie monitors and set the preamp switch to LINE. The only thing you may consider is to buy some extension cables because the cable attached to the turntable is rather short but it depends on how far you place your speakers. I did this and there’s no sound coming out of the CR3’s. Do you think they’re defective speakers? I have the AT LP-60 set to LINE and have the RCA cable from the turntable going into the RCA jack on the speakers; I’ve also tried plugging into the AUX port on the front of the CR3’s. Have you tried using your Mackie CR3 with other devices like a computer or mp3 player? First, I would check if your speakers work with other devices. Try your computer or an mp3 player, CD player, iphone or tablet. I know this sounds obvious but it doesn’t hurt to mention it, make sure it’s plugged in, the power button on the back is ON and turn the volume knob clock wise until it clicks. Then turn the volume up. The ring surrounding the volume know should be illuminated. Thank you so much for the helpful tips. I went ahead and bought a pair of the Mackie CR3s for my LP120. Other than what is included in the boxes for both the record player and the speakers, would you recommend anything else for a basic setup? Cables, etc.? Once I figure that out, I can start to get fancy with pre-amps and bluetooth receivers, etc. With your AT-LP120 and your Mackie CR3s speakers you are pretty much set. If you are going to place your speakers far away from your turntable you may consider some extension cords because the cables that come with the LP120 are quite short. If you have time, I would like you to post your experience with your AT-LP120 after you have time to use it. Other readers would benefit from your experience and opinions. Happy listening!! I recently purchased the Audio Technica LP 120 with Edifier R1280T powered speakers. I connect it to the internal pre amp and I am not getting any sound. I am quite the beginner and fear I may have bought the wrong speakers. What am I doing wrong? Your Edifier R1280T should work fine with your AT-LP60. Just make sure you set the preamp switch on the back of your turntable to LINE. Then connect the RCA cables of your turntable to Aux input on the the back of your Edifier Speakers. Make sure you select Aux on your speakers. This should do. If you need more help, please let me know. I have a audio technica turntable hooked to my receiver using a surround system. The problem is, I like having music playing while watching tv (sports, muted) but with my setup I have to have it on AV which eliminates the tv viewing. I was looking at Wharfdale speakers but I don’t think this solves the tv viewing problem. I want speakers that will connect directly to the Audio Technica but still have a great sound. Thanks for your comment. I would like to know what brand and model of receiver you have. I would think that the receiver has more than one input that you could use for your Turntable. I know there are some receivers that allow you to choose the the audio source and pair it to a video source. If your receiver doesn’t have that capability, then you need a powered speakers. The Wharfdale speakers cannot be directly attached to your Audio Technica. Any of the speakers mentioned in this post should work fine for you. I bought a pair of Mackie CR4 and hooked them up to my technics 1200 m3d’s. I hooked up only the RCA cables and I got a very low sound Do I need to hook up the ground wire to a preamp? I used to have a scratch mixer but no longer have one. Space is an issue. What do you suggest? Your Techniques 1200 has a PHONO level output. PHONO level is very low. Your Mackie CR4 has LINE level inputs so you need to convert the signal coming out of your Turntable to a LINE level. This is why you need a preamp. And yes you should hook up the ground wire to the preamp. Hope it helps. Hi I got the AT-LP60 hooked it up to a Bluetooth transmitter and then that up to a Piple S5 speaker. The speaker has volume control on it but although music is playing on the speaker it’s not controlling any of the volume. Not on line or phono. Is there any way to fix this without buying a new speaker? Thanks. I was looking at the Piple S5 speaker. I couldn’t find the manual online. But I see that it has two buttons for the volume. It looks like those two buttons have two functions: forward-backward, volume up-down. I’m guessing that there should be a way to switch between those two functions. Read the manual carefully. Otherwise, I would say you have faulty speakers, because the AT-LP60 doesn’t have volume control anyway. Keep me posted and good luck. Thank you so much! You just saved me a bunch of money! I’m not sure why I didnt think of that. Ha ha. Thanks!! Great thread. Thanks for your time and input. Hooking up an AT LP-120 turntable, simply, and not necessarily inexpensively. Wondering if you had any input or experience with the Audioengine A5+, JBL LSR 305s, or Mackie MR mk3 series (MR5, 6 or 8)? I am looking to fill a fairly large room with the best sound. I normally recommend powered speaker to somebody that wants a simple and affordable setup for their turntable. 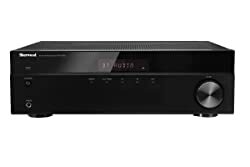 But if you are really looking to fill a large room with the best sound, you should consider a good receiver with good speakers. Monitor speakers are great but you don’t have control over the sound. Super informative review, tutorials and thread. Thanks for your time. Quick question regarding your opinion on speakers / monitors to hook up to the LP120. Do you have a preference on the Audioengine A5+, JBL LSR305 5″, or Mackie mk3 series (MR5, 6 or even 8) for direct hook up to the LP 120? I am filling a large room, and am interested in the easiest best sounding set-up. Appears that the Audioengine A5+ has a remote to adjust volume, which would be quite nice. Thanks again for your time, just wondering your opinion. I would go with the Audioengine A5+, since it is easier to setup and have a remote control. Have you consider buying a receiver or home theater to have more control over the sound? I was thinking about getting the LP-60 but at the end I received the Reloop RP-1000 M as a gift, do you know if I can connect him the same way as the LP-60 or should I use an amplifier? and if so, is there a general rule on how to buy a cheap but solid one? in general, any thought about the RP-1000? No, you cannot connect it the same way as your AT-LPP60. The Reloop RP-1000 doesn’t have a built-in pre-amplifier. You would need to buy a preamp. Prices vary a lot, from a few dollars to hundreds and even thousands. If you are on a budget, try the Behringer PP400. For the price it’s a decent preamp with a very basic RIAA equalization. If you want something better try the ART DJ Pre II, Pro-Ject Audio – Phono Box MM or Audio-Technica AT-PEQ3. would connecting the turntable to a pre-Amp and from there directly to amplified speakers as the Audioengine A3+ will work? will it damage the quality the fact that I don’t use an external Amplifier? some people say it works great for beginners like me, other say it’s not worth the money without an Amp. Do you mean Audioengine A2+? Yes it will work. You connect your turntable to the pre-amp and then to the Audioengine A2+. If I were you, however, I would probably consider buying a receiver with a phono input and a pair of bookshelf speakers. That will give you more control over the sound and a better listening experience. It depends also on how you are going to use your audio equipment. Would you be working at the same time you listen to music? Would you listen your music in the living room on a comfy chair? Do you have space constraints? My initial thought was to avoid buying a receiver since I study in Italy and I’m going to finish studying in a couple of years so I don’t want to transport a lot of heavy equipment in planes. I’m an easy listener, just in love with the sound of vinyl and want to listen to music as it was when the band just released her, I’m not an audiophile that know’s how to play with equalizers, also, I do have a bit of space concerns. I was thinking on spending about 300 euros in total, can go up 100 euros or so. Considering that you are going to travel once you finish your studies in Italy and that you are an easy listener, I would say, go for the Audio Engine A2+. I have moved so many times. I know the hurdle of having to take all your stuff from place to place. I always ended up selling and giving away my stuff. We have Audio ATLP 120 USB. Connected to our Harman Kardon HK 3380 receiver. Sound volume is great, but sound quality is very distorted (scratchy sound). Do you have any advice to what I may be doing wrong? Thank you! Your Harman Kardon HK 3380 receiver has an input labeled PHONO IN. You have also other audio inputs like CD IN. 1. Connect your turntable to PHONO IN. Make sure to set the preamp switch on the back of your turntable to PHONO. If you set the preamp to LINE, it will sound distored! 2. Connect your turntable to CD IN. In this case you have to set the preamp switch on the back of your turntable to LINE. If you set it to PHONO, it will sound distored or the volume too low. I just bought the LP-60 and the M audio av32 (new model I guess) hooked everything up, switched the output to phono and all my records sound absolutely horrible. Scratchy, bass distortion, etc. Everything from rock to alternative to classical, anything I try is essentially unlistenable. Any ideas what the problem could be? I’ve checked all my connections, I plugged my phone into the Aux input of the speakers and they sound fantastic. I’m at a total loss as to what the problem could be. Thanks! Correction, the switch is set to LINE, not Phono. Yes, it should be set to LINE. But in the end, I didn’t understand. Did it work or are you still having issues? I am considering the Audio Technica LP60 but am not sure if my Bose Soundlink speaker is compatible. There is only the AUX plug-in on the back of the speaker. Can you help me and use idiot-speak? Ha! Thanks in advance! Your Bose Soundlink has an Auxiliary input on the back. The AT-LP60 comes with a RCA to 3.5 mm jack adapter. 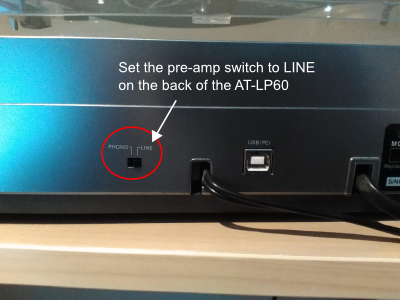 You can connect the AT-LP60 to your Bose Soundlink without a problem. Just make sure to set the turntabble preamp switch to LINE. You could also buy a bluetooth transmitter and connect it to your turntable using the adapter cable. This will allow you to wireless send the music from the turntable to your Soundlink speakers. Let me know if you need more information or clarification. I am trying to hook up my turntable to a receiver but for some reason I am not getting any sound through the speakers. Any advice? I have the audiotechnica LP-60 and a marantz receiver hooked up to speakers. Any help is appreciated! Thanks! Can you give me more information about your set up? Does your marantz receiver have a phono input on the back? If so, make sure you set the preamp switch to PHONO. If your receiver doesn’t have line inputs then set the preamp switch on your turntable to LINE. What model of marantz receiver do you have? Hi, I have the Audio Technica AT-LP60 turntable and after my old speakers went out (which was hooked up to a boombox, ala 1991) I found your article, so I went out today and bought the Logitech z323 speakers with Subwoofer at Best Buy today. I hooked it all up and —- no sound at all. I rechecked all my connections and also made sure the turnable was set to LINE on the back. Am I missing something?? I really want to use my turntable again and am quite frustrated — I was hoping to avoid buying a receiver at this time. Any help is much appreciated! Thank you very much for commenting. If you don’t mind I’m going to leave your comments. Other readers will benefit from your experience. But if you ever want me to remove it, just let me know. I’m glad you worked it out. AT-LP60 Turntable connected (via RCA) to M-Audio AV32 10-W – at top volume sound is almost inaudible. When I use an iPad and the speakers at top volume it is very loud. Is there a reason that the speakers perform poorly when connected to the turntable via RCA? Checked and rechecked the connections, etc. Frankly, this setup is hard to foul up since it is very simple. If you continue to have this issue, let me know. Probably going to be buying the lp60 tonight. If I buy the Logitech z323, do those hook right up? What else would I need to buy to get it ready to go? If you buy the AT-LP60 and the Logitec z323, you are set to go. No need to buy anything else. I just purchased a turntable Audio Technica and actually have that exact pair of Behringer Ms40 speaker/monitor that you have listed above. When I had used them for computer speakers/recording in the past they kicked! Really nice sound. So, I hooked up the turntable to them and they sound great but waaaaaaay too quiet. If I want to keep the same speakers what do I need to get? Thanks for your time! you know what, I figured it out…Had the switch in the wrong position. Sounds glorious now. Cheers! Since you experienced this same issue–can you tell me what switch you had in the wrong position? I just responded your other comment. Just make sure that the small pre-amp switch on the back of yiour AT-LP60 is set to LINE. If you continue to have this issue, let me know and I’ll try to experiment with it. Keep me posted. Hello, I like the comparison chart of powered speakers. I noticed some do not have USB. I’m kind of interested in having the option to plug the speakers into my laptop from time to time, though, especially since my laptop has a junky, tinny speaker. If I select something from your chart that does NOT have the USB, do you think the presence of the 1/4 inch jack, alternately, might afford me the option to plug the speakers into the laptop’s headphone jack to listen? Thanks for your comment. From the comparison chart, the only one with USB connection is the Alexis M1. All of the monitors listed are meant to be connected to a computer since they are monitor speakers used for studio recording. As long as you have adapter cables(1/8 to RCA, etc. ), you can connect them to your laptop without any problems. The Alexis M1 is very interesting, because you can connect your turntable to the speakers and then the speakers to the computer for digitizing your music. I am considering a Audio-Technica AT-LP120-USB as a Christmas gift for someone who would like to get into playing vinyl. The speakers I have seen recommended for this turntable are fairly pricey. As a start, is there any chance this turntable could be used with a Bose Mini Soundlink Speaker? The AT-LP120 can be connected to a pretty much any powered speakers. The Bose Mini Soundlik Speaker has a 3.5 mm aux input. You can connect the AT-LP120-USB to your Bose Mini Soundlink using the cable adapters that come with the Turntable. Another option is to buy a bluetooth wireless transmitter with a 3.5 mm jack that cost about $20. That way you can use any bluetooth wireless speakers with your turntable. Thank you for the information. I just want to make sure I’m understanding this correctly, I’m new to vinyl and have just recently started my collection, I’m thinking of buying the AT-LP 160 with the Mackie CR3 speakers you mentioned in the article, so if I buy those two things and connect the RCA Cable that comes with the Turntable to the speakers, I’m good to go? I’m fairly new to this so I do not plan on spending lots of money on a receiver, maybe in the future, but is this initial setup good for me to listen to some of my records on? Yes, that is correct. If you buy the AT-LP60 and the Mackie CR3, you are good to go. Just connect the RCA cables from your turntable to the back of the Mackie CR3 and you are set. I have an Audioengine A5+ paired with the AudioTechnica AT-LP120 turntable. As you pointed out in the article, the appeal of a simple system falls away when you realize that you do not have a lot of control over sound quality. Which is the best approach in upgrading my system so that I could still use my A5+ speakers, which of course have a built-in amplifier? Should I get an integrated amp or a receiver? Any specific recommendations which brands/models? Thanks for your comment. You are right, that is the problem with the monitor – computer speaker setup. In your case I would probably get an Onkyo Integrated Amplifier with LINE outputs. The problem is that yiour A5+ is powered, so you cannot connect them to the speakers normal outputs. You may also look for a Receiver that has LINE outputs. There are some Yamaha Receivers out there with audio line level outputs like the Yamaha RX-V377. You may also consider the option of connecting your Audioengine to your computer and use some software tools to control your sound quality. If you need more info about this option let me know. I just bought the Autio Technica turntables AT-LP60 and am looking to buy a receiver and speakers to go with it. I’ve read through a lot of your detailed information and really appreciate it. However, one thing I’m wondering is how you know if a receiver is phono or line? I was looking at getting Yamaha R-S201BL 2-Channel Stereo Receiver. Would this receiver suffice? And Polk Audio Monitor-35B Bookshelf Speakers. Would that all work together? Its easy to know if a receiver is PHONO or LINE. On the back look for the inputs that are labeled PHONO and LINE. They are RCA inputs with colors read and white. Many receivers have both PHONO an LINE inputs. You decide which one you want to use. Some modern receivers don’t have PHONO inputs, but that is not a problem because the AT-LP60 gives you both options. are a good choice too. Setup your AT-LP60 preamp selector to LINE. Connect the RCA cables of the AT-LP60 to the Analog In inputs on the back of your receiver. That’s all there is to it. As for your TV and Bose speakers, I would need to know the brand and model to help you. But it should be pretty simple. If you need help, let me know. We bought my son the Audio-Technica LP-120-USB for a birthday present and he’s been using some used M-Audio Studiophile BX5a monitor speakers but I am thinking about getting him a receiver and speakers. I was considering a TX-8020 receiver (for more control) and I was considering some Pioneer SP-FS52-LR speakers. Thoughts? Recommendations? Really appreciate your time and patience in responding. Thanks for your comment. 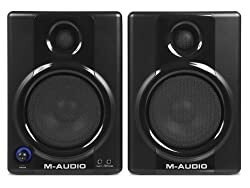 The M-Audio Studiophile speakers are quite good, but as you said, in order to have more control over your listening experience you really need a receiver. I think the Onkyo TX-8020 is a great option, and so are the Pioneer SP-FS52 speakers. You may also consider the Polk Audio Monitor Series II, Polk Audio TSi300 or the JBL ES80. But I still think your choice is the best in terms of value for the price. Thanks so much for the information and your time to respond. I will definitely keep you posted. Both of my value suggestions should be easy to set up with the 120, correct? Sorry for yet another similar question, but I am looking into a return to the vinyl listening days of my youth, but budget is tight!! I am very keen on the AT-LP60, and just want to confirm my understanding from the posts above. I already have a Harmon Kardon Go Play docking station.From what I can see, I would be able to connect the AT-LP60 to this by using the RCA to 3.5mm adaptor that comes with the turntable, and turn the docking station into my speakers. Obviously a short term arrangement, but at least it will get the vinyl playing if it works!!! Thanks for your comment and feel free to ask. I love helping and other readers may benefit from our discussion. You are right, your Harmon Kardon Go Play has a 3.5 mm auxiliary input. Your AT-LP60 will work with it. You will need to use the RCA to 3.5 mm adapter that comes with the turntable(as you already mentioned). Just remember to set the preamp selector to LINE. I forgot to mention that my computer already is connected to small Harmon-Kardon speakers. Can I leave them connected and still use the new and better speakers attached to the female wires while the USB goes to the computer? Thanks for leaving a comment and congratulations on your new turntable. The RCA cable is the one attached to the back of your AT-LP 120 USB, it has a black and red male ends. If what you want is to connect your turntable to your computer, you don’t even need to buy speakers as you already have the Harmon-Kardon. Just plugin the usb cable from your turntable to the computer and ignore the RCA cable. Set the pre-amp switch to line. You may need audacity to be able to listen your LPs through the computer and your Harmon-Kardon. 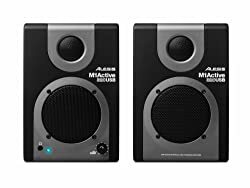 If you still want speakers for your turntable, buy the Alesis M1 Active 320 USB. Just connect the red and black male ends of the turntable to the Alesis M1. Then connect the Alesis M1 to the computer using the usb cable. Set the pre-amp switch to line. In this case you don’t need to connect the turntable’s usb. If you want I can make a detailed tutorial for you with detailed explanations. I don’t have the AT-LP 120 USB but I have the AT-LP 60 which has the same connections. Let me know, and I’ll make the tutorial for you. I know nothing about what a RCA cable is but I am trying to chose one of the five speakers for my new audio-technica AT-LP 120 USB. What speaker allows me to connect the turntable to the computer with the USB? I put the switch to line and have a black and red female ends, but I have a USB also. I am confused. Do the speakers have male plugs that the female ends push onto and if I also plug the USB into the computer can I just leave it plugged in? The diagram does not show these female ends or the speaker connection hook up. I know the techincas have a built in pre amplifier so an external one is not needed. I actually just wondered how it connects. Is it as simple as the cables built into the technicas plug straight into theactive/powered speakers or do i need an rca adapter?? you’d be surprised how hard it is to find a straight answer on the internet. Sorry for the delay. I usually reply within 24 hours but I’m out of town. I didn’t have Wi-Fi access until now. Autio Technica turntables AT-LP60 and AT-LP120, both have a built in pre-amplifier. But you have to make sure to set the preamp selector to LINE on the back of the turntable. You are right, no need for an external pre-amplifier. Both players have an RCA cable attached to the back. It’s hardwired so the cable cannot be removed. If you have power speakers with RCA input, you don’t need any adapters, just connect the cable straight to the powered speakers RCA inputs. Just be aware that the cable on the Audio Technicas is very short. If you are going to place the speakers away from your turntable you’ll need to buy extension cables. I modified this post to make that clear. You may want to read it again and look at the new diagram. What about bose companion 3 series II. The sub powers the 2 speakers via rca. The sub also has a line in. Could I run these record player into this using the proper adapter that comes with them? The RCA connectors that power the speakers should not be used for connecting your turntable. Those connections are only for the speakers. The Audio Technica AT-LP60 and AT-LP120 come with an RCA to 3.5 mm adapter. You can use this to connect the turntable to the Bose Companion 3 series II. If I’m not mistaken, the Bose Companion 3 series II has a control pod. It’s a circular unit that has a 3.5 mm line input. You can connect your turntable to the control pod using the adapter that comes with the record player. Just remember to set the pre-amp selector to LINE. So yes, you can use these record players with your Bose Speaker System using the adapter that comes with them. Can you tell me the model number and brand of your transmitter? That way I can tell you exactly what to do. Remember that both the AT-LP60 and AT-LP120 come with cable adapters. Just use those. Depending on your transmitter you may need the famale or male ends (openings). But as I said before, if you give me the model number I can help you better. Thank you for the information, I just have a quick question regarding the Alesis M1’s and using them with the Audiotechnica LP-60. I’m thinking of buying the pair of speakers but I am curious as to if I’ll need to buy RCA cables to connect the speakers to the table or is that included with the speakers? The Alesis M1 Active 320 USB doesn’t come with RCA cables, but you don’t need to buy them because the Audio-Technica LP-60 has RCA cables attached to the back. However, the RCA cables are short, depending on your layout you may need to buy extension cables. If you are going to place the speakers close to the turntable, then you should be fine, no need to buy RCA cables. Let me know if you need anything else.